Can I Give My Dog Cherries? While we certainly would not turn down a fruit basket filled with apples, peaches or plums, few things warm the heart quite like a basket of fresh cherries. This delicious, nutritious food has always been a favorite among those of us who sometimes struggle to eat enough fruits and vegetables, but for many of us, the love of cherries goes even deeper. We stuff cherries in pies, plop them atop ice cream sundaes, and print their likeness onto our clothes and cell phone cases. Cherries are festive and decadent, but they also inspire a sense of nostalgia in many of us who can recall childhood summers spent eating cherries by the handful. It’s safe to say that we love cherries—and, due to their small size, they are all too easy to toss to your dog for quick treats. But should we be feeding our dogs cherries? Can dogs have cherries? 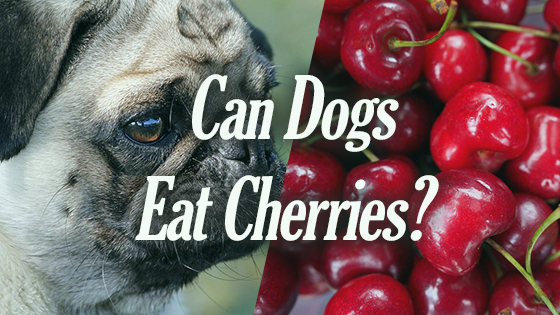 The answer: no, dogs should not eat cherries. Though giving Fido a little bit of cherry flesh is not likely to result in a medical emergency, there are many serious health risks associated with the stems and pits. In fact, if you feed your dog whole cherries, they may suffer from life-threatening cyanide poisoning. Do your beloved canine friend a favor and give them apples or bananas instead. If you, like so many of us, are a bit of a health nut, you are probably prepared to take up arms defending the reputation of your beloved cherries. They are superfoods, you say, and you will fight to the death to defend their good name. And you’re absolutely right! For humans, cherries are among the healthiest fruits we can include in our diets. Some of these benefits may apply to our dogs, too. 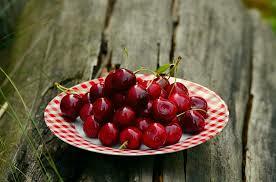 Cherries are renowned for two things: their antioxidants and their anti-inflammatory properties. Antioxidants are known for destroying the dangerous free radicals that cause the cell damage which so often contributes to cancer, diabetes, heart disease, and other debilitating chronic illnesses. Cherries’ anti-inflammatory superpowers have often been praised for aiding in athletic recovery, particularly for distance runners who need to recover faster and reduce their chances of injury. There is also some evidence that cherries may help combat the symptoms of inflammatory illnesses like arthritis, reducing pain and swelling while improving mobility. In theory, all of these health benefits would apply to our dogs, too. Dogs suffering from arthritis often respond well to having their diet supplemented with anti-inflammatory foods, so feeding your old or arthritic dog pitless, stemless cherries in moderation may help reduce pain levels and improve mobility. There is even some thought that cherries can slow the cognitive decline that afflicts so many dogs (and humans!) as they age. However, the risks of feeding your dog cherries generally outweigh the benefits due to the toxicity in the stems and pits. Cherry pits contain a deadly poison called cyanide, which can be deadly to your pets at lower doses than it would take to hurt you.  Cyanide is harmful because it inhibits an enzyme called oxidase, which is a vital piece of the cellular oxygen transport process. If oxidase is inhibited, blood cells cannot properly deliver oxygen to organs throughout the body—including the heart, lungs, and the brain. If your dog has consumed a toxic dose of cyanide, they will develop symptoms like labored breathing, excessive panting, dilated pupils, discolored gums, and shock. Left untreated, cyanide poisoning will likely be fatal. If your dog has eaten more than one or two cherry pits, it may be best to take them to the vet’s office asap; your veterinarian can induce vomiting and administer activated charcoal to reduce absorption of the poison. The dangers don’t stop there. Whole cherries pose a choking hazard because they are small enough to avoid chewing, yet big enough to obstruct airways. There are risks later on in the digestive process, too— even if your dog only eats one cherry pit (which likely will not result in toxicity), they may suffer from a painful digestive blockage. Symptoms of an intestinal blockage include vomiting, diarrhea, inability to pass stool, drooling, low energy, gas, restlessness, abdominal pain and bloating, and behavioral changes. Blockages can eventually be fatal if left untreated, so if your dog eats whole cherries and suffers from any of these symptoms, take them to the vet’s office. Overall, it’s probably a better idea to avoid feeding cherries to your canine companion. Though cherry flesh has the potential to provide valuable antioxidant and anti-inflammatory health benefits, cherries as a whole come along with too many risks. Feeding your dog whole cherries can result in choking, intestinal blockage, or deadly cyanide poisoning. Instead of obsessively pitting cherries, opt for more dog-friendly fruits such as apples and blueberries. These fruits can provide many of the same benefits of cherries with far fewer risks. Can Cats Eat Pineapple? Can Dogs Eat Ham?